Glo no doubt has the worst network reception in Nigeria at the moment. But you also can deny the fact that they have some pretty tempting offers such as the Jumbo SIM that makes thier customers stay around even with the poor network service. Glo which is called the grandmaster of data in Nigeria has further slashed thier already affordable data plans with the new plans tagged #GloUnfairAdvantage. This new plan gives you extra 50% data, double the value of your subscription when you auto-renew you package for instance, "N1000 gives you 1.6GB + 1.6GB (double data) + 800mb (50% extra) = making it 4GB in total". Just make sure you renew your data plan before it expires or not more than 48hours after it expires to be qualified for the new unfair advantage data plan. Glo now offers you free YouTube streaming offer just like Airtel and 9mobile. You can stream YouTube Free of charge from the hour of 1am – 5:30am every day. To qualify, just make sure you renew your data plan before it expires or within 2days after it expires with at least N500 data package or above. iFlix, just like Netflix allows you to stream different movie channels at a pocket friendly price. 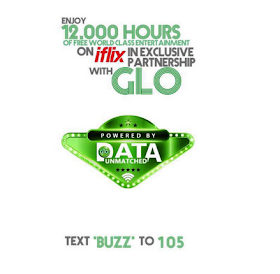 Glo just partnered with iFlix and you won’t be charge any dime from your data if you are streaming iFlix on Glo network for 12 hours. To qualify for this offer, send SMS Buzz to 105 or download GloCafe App. How I wish Glo can also improve more on their network reception, that way everyone will be able to enjoy thier affordable and mouth watering offers. This is a well appreciated article of yours. New development on glo free browsingthat works on UC super Mod.